You’d think an important part of the job description for a driver who shuttles pax from the terminal to the aircraft would be to make sure everyone gets off the bus and on the plane. 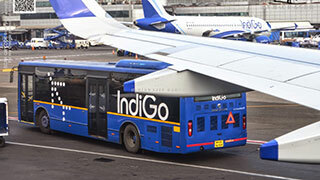 That didn’t happen recently at BOM, and the incident has put Indian airline IndiGo under scrutiny. But it wasn’t just the bus driver’s fault after a checked-in pax fell asleep and failed to get off. Airlines go through multiple head count checks during boarding and on the flight, and it is unclear how crew failed to spot that they were one passenger short. However, the flight took off and the bus was parked and locked, trapping the sleeping man for six hours. The man, who did not want his identity disclosed, said he dozed off due to exhaustion after working nonstop for more than two days. "I was in Mumbai for official work and continuously working for 2-3 days. I was very tired and fell asleep after I sat on the back seat, close to the air-conditioning vent," he said. "I spent the entire night at the airport and took the first flight to Bangalore in the morning." He added that he was at first considered a trespasser after being found in the bus before he had the chance to prove his story. "In this case, the procedure was not followed and police and Bureau for Civil Aviation Security have been informed," an airport authority official said.